I hope where you are it's cooler than where I am! In the middle of a record breaking heat wave, I am down with a cold turned sinus infection! Oh well... this too will pass. Today I wanted to share a project I made some time ago but never showed, as I was hoping a magazine might pick it up. However... this is strawberry season and I decided to share it with you now. I made my own template for this and some day if I can figure out how to do it, I will put it on line to share. The pretty strawberry border is from Layers of Color and is called Garden Border. Be sure to check out the other great borders in that set! I colored with Copics and made four borders to wrap around the top of my basket. The basket was cut from 12 x 12 card stock and sponged with distress inks. The basic pattern is of the square bottom and the two pieces for each side. Then there is a band that wraps around the top, giving rigidity and finishing off the inside nicely. Then the garden border is adhered over that. Very simple and I hope to figure out how to share the pattern. I don't have PDF maker and I can't scan 12 x 12 so I'm not sure how to do it. If I figure it out, it will be filed under my Tutorial Tab. Have a wonderful weekend, and to all my east coast US friends.... stay cool!!!! Stunning project yet again Grace, love the border. What a gorgeous basket! That border is stunning! You are so creative! as always it is just beautiful ! I am so sorry to hear you too are sick I have the same thing have for almost a week now, first time ever for a sinus infection. I hope your feeling better real soon. Love your basket and the boarder is beautiful. What a great gift it would make! Great project and the border is wonderful! Feel better soon. This is awesome Grace. You always have the best 3d projects. I love the sponging. I hope you feel better soon. Dave has a cold too. He is out trying to sweat it out in the basement. Hope your meeds work fast. Have fun with your sister. Praying the meds will kick in soon, Grace. 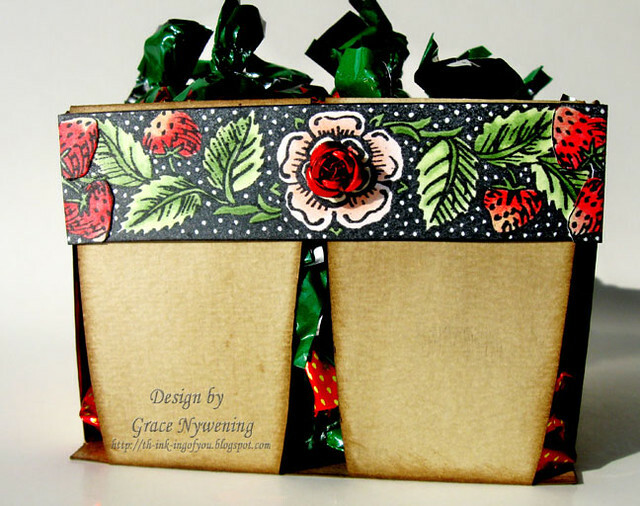 Love your project and the way you added to the band to give some dimension with the flower and the layered strawberries. So glad you decided to share it with us Grace it is adorable. Perfect for our Summer theme. Thanks for sharing with us at Little Miss Muffet Challenges. Винаги ме радват красивите Ви творения!!!Поздрави! What a beautiful box Grace. Oh my dear Grace ~ This is gorgeous! I know where you are coming from with the heat...It is sweltering here in Bama too. Amazes me that the north is also going through this heat wave...I always thought that you guys were staying cool...not so, I see. Take care and drink lots of water my friend...it is kind of scary. But, again He is watching over us...and my faith is so very strong....I do not worry!! Have a wonderful weekend girl! Grace this is the prettiest basket I've ever seen. Your papers and style designs are so incredible I could get lost here on your blog for days just saying WOW!!! Thank you so much for all the blog love you leave me. This is fabulous! I can't believe it didn't make it into a magazine. Such a perfect border, you've colored it perfectly. Sounds like the only way to share the pattern is to do it the old fashioned way and post the measurements, hee hee. I thought it was an altered actual basket! I am SO sorry to hear you are ill, especially while you have plans with your sister. I will be praying for you. Please be sure to drink a lot of water anyway. This basket is AMAZING! It really looks real! The distress inks have really worked wonders on this! And, your colorful border is colored so beautifully. I love those little red flowers, too! I am especially fond of those sugar- loaded strawberry candies in the basket! Haven't had them, and I shouldn't, for years! This is a fabulous project, Grace. I am taking the afternoon going through your blog today...wonderful for me! I am making up for all of the awesome things you made this past month when I was away from the computer when I was sick, praying that you will be healed quickly. All things are possible with God! We love you! Grace, This is so lovely. What a creative project (I'll be keeping an eye out for that tutorial ;D ) The coloring of this border is beautiful as well! Hope you feel better soon! You'll be in my prayers tonight. 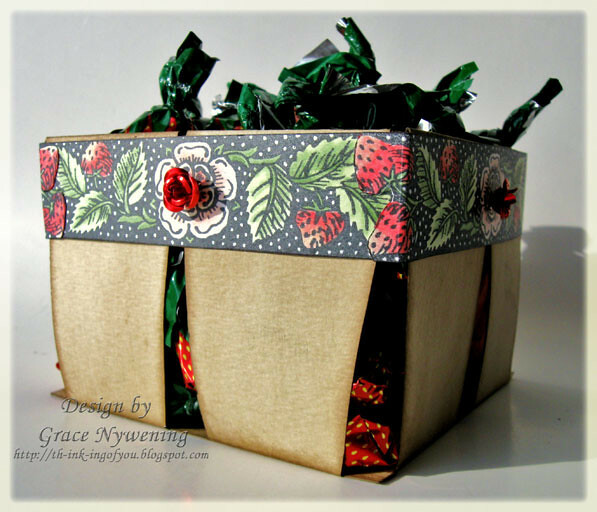 This is a gorgeous project Grace and such a lovely idea for a gift basket! I hope you feel better soon! Thanks for joining us for the Summer challenge at Little Miss Muffet stamps! Fantastic job! What magazine wouldn't pick this up, very creative. The best sleep.... under a quilt! SSIS His Ways are not our ways!